DENVER (AP) — Large wildfires grew across the American West on Wednesday, keeping thousands of people out of their homes for the Fourth of July holiday and forcing some strict bans on fireworks to prevent new fires from igniting in the hot, dry region. The National Interagency Fire Center on Wednesday reported more than 60 large, active blazes across the country, most in the drought-stricken West where holiday festivities led to increased fire danger. The third-largest fire in recorded Colorado history kept expanding, at press time having chewed through 147 square miles near Fort Garland, about 205 miles southwest of Denver. The Spring Fire had destroyed more than 100 homes, and over 2,000 had been evacuated. 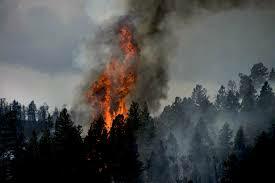 Officials said that preventing the flames from spreading toward the small mountain town of Cuchara was a priority. Some fireworks displays were scheduled to go on in Denver and other large cities, but several mountain communities called off their holiday festivities to avoid any risk of flames. Parts of Colorado and other Western states have been grappling with severe drought that has made wildfires explosive so far this season. Utah authorities ordered more residents to evacuate as a blaze grew to about 62 square miles near a popular fishing reservoir amid high wind gusts, steep terrain and dry conditions. It wasn’t clear at press time how many more people were told to flee, but several hundred homes and cabins had been evacuated and the orders were extended to a 20-mile area dotted with cabins. The fire roughly two hours southeast of Salt Lake City had destroyed about 30 structures at press time. Officials in Utah closed a portion of Strawberry Reservoir so planes could scoop water and drop it onto the flames, but people could still boat and fish on other parts of the reservoir Wednesday. A nearby RV campground tucked among cliffs and canyons was closed, leaving those hoping to visit for July 4 to find another spot. Officials said the fire that had scorched 129 square miles in a rural area northwest of Sacramento was slightly more contained than the previous day. Roughly 2,500 people had been forced from their homes. Fire spokesman Israel Pinzon said officials lifted some mandatory evacuations Tuesday night, though he didn’t know how many people were allowed to return home.